The day has finally come to end up the unfinished business between the two famous and amazing boxers in the world in the feather weight division. Yup, 16th of March is another additional historic event not only for General Santos City, but for the whole Country of Philippines. Approximately, 12:00 noon Pacific Time, the fight of the two legends has to come an end and had to prove to the world that really is the best among the best. People in GenSan stops working or whatever they’re doing to focused and give attention to the said event of the day. The fight between Marquez and Pacquiao was totally scaring and a take breathing one, everyone was really astonished when Pacquiao knock-out Marquez in Round 3 and there is another knock-out but “thank god for Marquez it was saved by the bell”. Every Filipino was really crossing fingers of the said fight. Actually since I can’t afford on the pay per view, I listened to the radio and did listened very carefully, the fight reached the 12 rounds and everyone was really thrilled of the split decision by the judges. And when it was announced that they do have a NEW WBC FEATHER WEIGHT CHAMPION, everyone was jumping and hugging for it truly was shown to the world that Filipino raises up into sports. 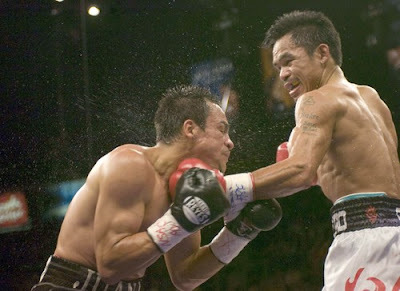 I got Goosebumps into everything and CONGRATULATIONS TO EMMANUAEL “MANNY PACMAN” PACQUIAO. For giving us another NAME in the SPORTS INDUSTRY.